Receiving approval to burn with a burn permit is a quicker process now. The Fire Department utilizes an app which allows them to respond immediately, or at most within a few hours of the submission. The permitting process is monitored by the department on a 24/7 basis. 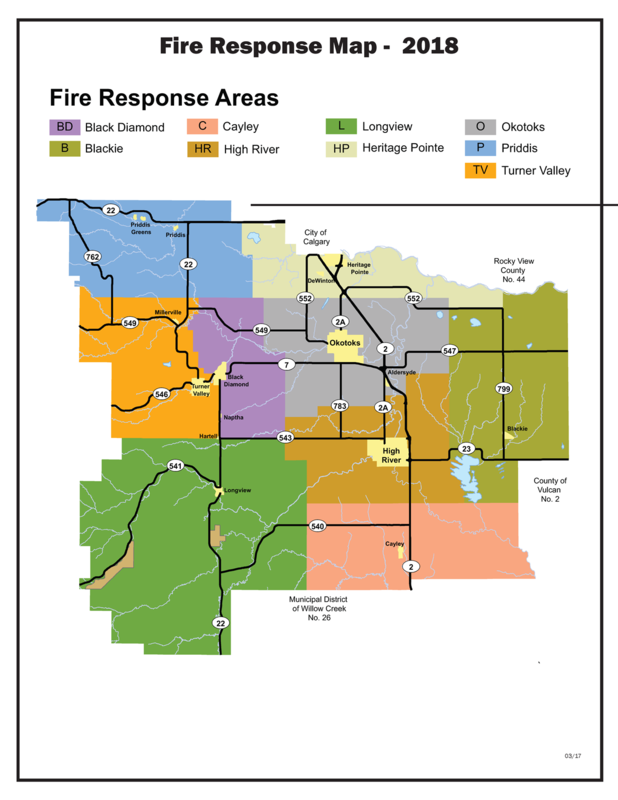 The new online burn permit application process replaces the Fire Guardian system. Foothills County and the Foothills Fire Department have had a long and successful working history with Fire Guardians who have been an invaluable resource. For any residents who are unable to access the online Burn Permit application, they may apply in person at the Heritage Pointe Fire Station for a burn permit or call the station at 403-603-3571. A significant benefit of the new burn permit process is that it will facilitate a faster implementation of Fire Burning Bans. It will notify residents who have an active burn permit of any Fire Bans or restrictions, directly to their cell phones. Plus, the new Burn Permit system will notify residents with active permits to extinguish their burns at 10 pm each night. The new updated Burn Permit process now has two classifications for burning permits. Class 2 is for large burns, any area that is 10’ X 10’ X 5’ or larger. Small residential fire pits and burn barrels do not require a burn permit if they have a spark screen on top. For all other fires, burning permits are required year round in Foothills County. APPLICATION TIP - have your tax notice handy as you will need your tax roll #, legal land dscription, 911 address. Visit http://burnpermits.mdfoothills.com for online burn permit applications. Tires - Plastics - Household Garbage - Paint Cans - Used Motor Oil - Furniture - Treated Products. Prohibited debris includes but is not limited to the above items. Fire permits are required year round in Foothills County. The responsibility for conducting a safe burn is yours. Anyone who sets a fire under authority of a permit must comply with the following requirements and conditions. See Burning Permits & Regulations Brochure above. Fire must be supervised at all times by a responsible adult. No burning is permitted when winds exceed 12 km/hr or are gusting. Suitable fire extinguishing equipment to be located at site. The 911 Dispatch Centre @ 1-888-808-3722 must be notified approximately one (1) hour prior to burn taking place. No burning is permitted between the night hours of 10:00 pm and 7:00 am unless a special permit has been issued by Foothills County. An accurate description of the size and the type of combustibles must be given to the Foothills Fire Department when applying for a permit. Any breach of the above conditions renders the permit null and void. Get your Burning Permit online here. Burning permits are valid for 5 days from the date of issue. If conditions warrant, permits may be cancelled at any time. Extensions may be granted under a new permit number, provided the required conditions can be met. As a condition of the burning permit you must inform the 911 Dispatch Centre @ 1-888-808-3722 one (1) hour prior to commencing burning. When disposing of a building or structure by burning, the building or structure must first be demolished. The burning of tires, plastic wastes or other toxic noxious materials or substances is not permitted. The Municipal Fire Chief, may suspend or cancel all permits or prohibit the lighting of fires in any part or all of Foothills County with a Fire Ban. The general public is notified of Fire Bans via local news media, this website, Facebook and Twitter. When permits are suspended or cancelled and fires are prohibited, all fires ignited under the authority of a burning permit must be extinguished immediately. Burning is not recommended when winds exceed 12 km/hr or are gusting. The person using the incinerator is responsible for its safe operation. If in doubt, contact Foothills County Fire Chief. Special regulations must be followed by those who have a fire permit to burn brush or debris after land clearing or other agricultural activities. If you are burning Agricultural lands (range/pasture, swaths or stubble), the Agricultural Fieldman or Assistant Agricultural Fieldman must be contacted 48 hours in advance of the burn. No fire shall be ignited for broadcast burning of grass or stubble without first obtaining a fire permit from the Fire Department at 403-603-3571. Windrows of debris must be no more than 60 metres in length. The area being burned must be completely surrounded by a guard cleared of combustible material to a width of not less than 15 metres. No windrow shall be closer than 25 metres to uncleared land or standing combustible fuels. Parallel windrows must be separated by not less than 15 metres.